If I’m being perfectly honest, I don’t really know what grabbed me about this book but something just did. When the pitch came through I wasn’t entirely sure this was something that I was interested in reading. Maybe it was the colorful cover or maybe it was the idea of a false memory. I don’t know but something made me think this was something that I would be interested in. Sara Shepard wrote the wildly popular Pretty Little Liars series so maybe that was what made me excited. I mean her books are popular right? She must be doing something right, so I agreed to read. This is Shepard’s first adult novel so obviously the stakes are high when you come from writing YA and try to break into adult literature. I was curious to see how that played out for Shepard so here we are. The deeper Eliza goes into her investigation while struggling with memory loss, the closer her life starts to resemble her novel, until the line between reality and fiction starts to blur and she can no longer tell where her protagonist’s life ends and hers begins (summary from Goodreads). So if this book was meant to be a suspense novel, I would say that Shepard nailed it if it was meant to be a psychological thriller I would say it was good but not great. I hate when a book lands in the middle. So what did I like? I liked that this novel kept me guessing at first. Could it be confusing at times? Yes, but on the whole I was more intrigued than confused….at least in the beginning. I mean it was all kinds of odd….not odd like I have no idea whats happening, but more odd like I know something is fishy but I’m not sure what. I liked that a lot. I thought there were some psychological elements in the story that were meant to have a greater impact on the story and add more of a darker thriller feel but I wasn’t sure that that came through strongly enough to completely move it out of suspense and firmly into thriller. 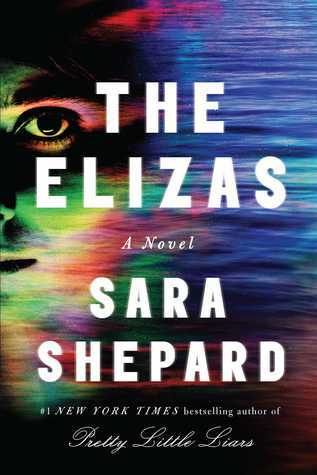 Eliza is clearly an unreliably narrator which I love, but sometimes I felt that what was reality and what was in her mind was a little too busy and could be confusing as the story went on. While I love an unreliable narrator, sometimes it’s difficult to execute. I wouldn’t say that Shepard’s attempt failed by any means, but I jut think sometimes it got to be a little much. Less is more. There were a few times where I felt like I needed to just put the book down and come back to it later. It wasn’t so much that I wanted to put the book down completely, more like I just needed a break from time to time. So I think the idea of this novel was for it to be a darker more adult thriller. I would say this is on the lighter side of thriller. It lacks the complexity that some of the more serious thrillers have, but for someone who is new to the genre and it’s not really their ‘thing’ or for younger readers transitioning to more adult novels….this is probably a good place to start. For die hard thriller fans, this is probably not going to be the book you were hoping. Overall it was ok for me. I am not a ‘die hard’ thriller person by any means, but at the same time I’ve read enough of the darker thrillers to have an appreciation for the genre and this book would be lacking for those die hard fans of the genre. Nice review. I know exactly what you mean about accomplished YA/New Adult authors dipping their toes into the adult pool. It’s not just the personalities of their characters or their thoughts and actions but how the story builds and the way the scenes progress too.